This is one of the larger Damselflies I came across in Japan. In Japanese the name is Kawa Tombo ( カワトンボ ) and in English it is known commonly as the Beautiful Demoiselle (Calopteryx virgo). She is female which is distinguished by the metallic green body and iridescent brown wings. These skittish creatures are quite tricky for photographers to get a good shot of because they move around in such a frantic manner but if you have the patience to watch and wait sooner or later they will warm to you. So today’s topic is about Dragonflies and Damselflies. 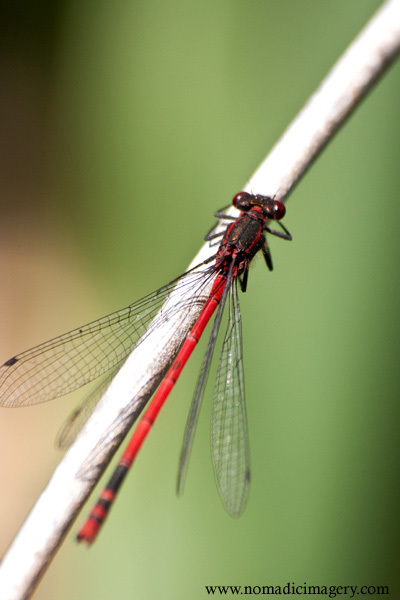 Dragonflies and Damselflies are insects in the order Odonata. The two are very similar in appearance but on closer inspection can be differentiated by the way the wings are positioned along the body or thorax. 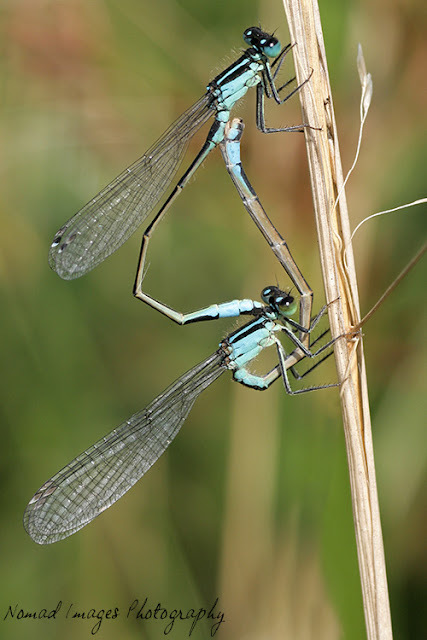 With Damselflies the wings are positioned along and parallel to the body when at rest whereas with a Dragonfly the wings are held away from and perpendicular to the body when at rest. Also, the hind wing of a damselfly is similar to the fore wing but with a dragonfly the hind wings broaden near the base and are bigger than the fore wings. 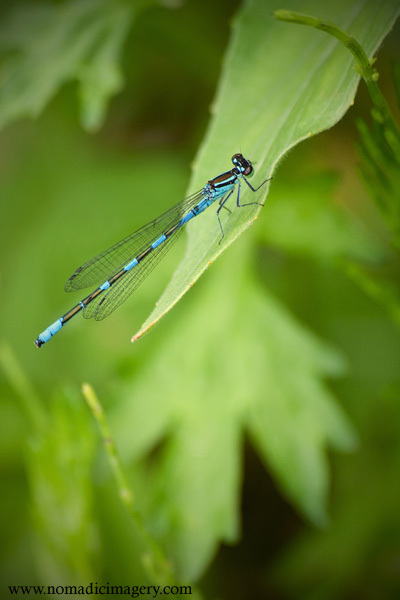 Other differences between damselflies and dragonflies are the positioning of the eyes. On a damselfly they are apart whereas on most dragonflies the eyes touch. Now we are in mid-summer a trip to any wetland habitat be it a small pond, a big lake, a babbling brook, stream or dike where aquatic plants such as the Sedges or Typha (Bulrush) are growing there is an extremely good chance of catching these beautiful, darting, restless insects skimming across the waters or simply resting on the vegetation. 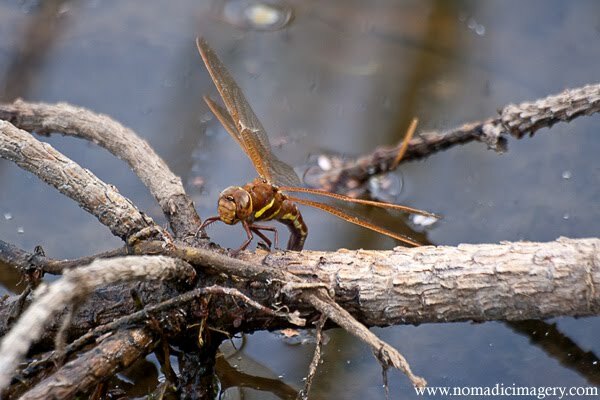 Ponds and lakes are ideal habitats for these strange looking insects. 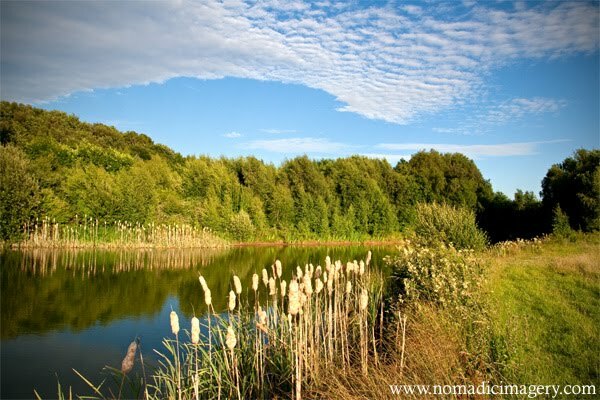 Reeds are used for resting on or laying eggs and harbour other small insects all of which are on a dragonflies or damselflies menu. You may if you are lucky, catch a nymph going through metamorphosis on a nearby leaf or even catch a pair of adults mating. Damselflies undergo incomplete metamorphosis with an aquatic nymph stage. The female lays eggs underwater or on surface vegetation. the Nymphs then feed on daphnia, mosquito larvae and other small aquatic organisms using extendable jaws. similar to those of the dragonfly nymph. Damselfly nymphs will molt several times before the winged adult emerges which will then eat flies, mosquitoes and other small insects. 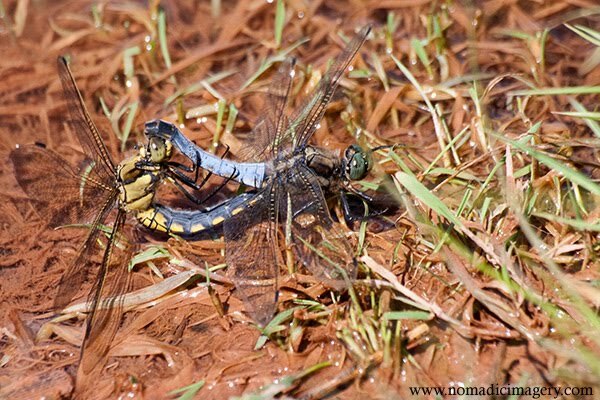 Female dragonflies lay eggs in or near water on floating or emergent plants.The eggs then hatch into nymphs which is actually the most part of a dragonflies life. 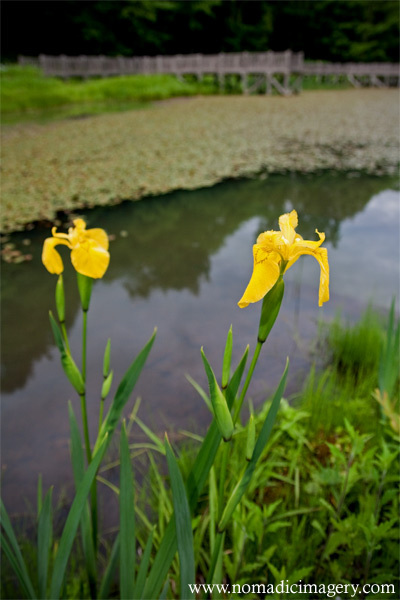 These then feed on mosquito larvae beneath the waters surface along with invertebrates and vertebrates such as tadpoles and fish although some nymphs even hunt on land. 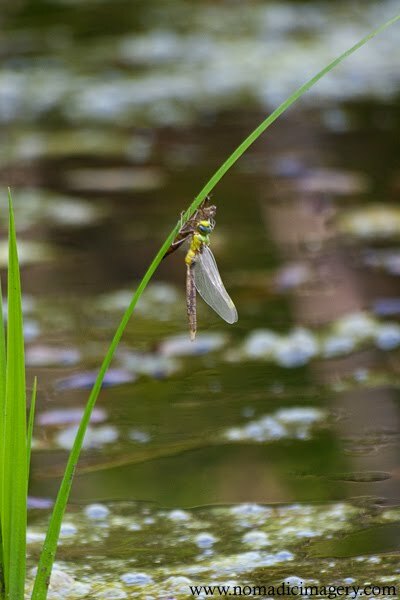 The larval stage of some dragonflies can last as long as five years but in smaller species it may only last between two months to three years. When the nymph is ready to metamorphose into an adult it climbs up a reed or other emergent plant and the skin will split at a weak point behind the head and the adult dragonfly crawls out of its old larval skin. 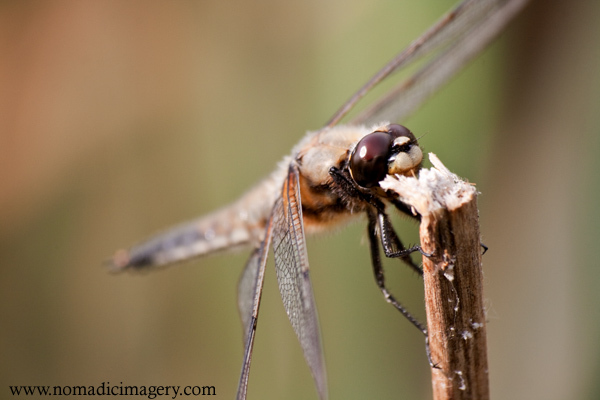 The adult stage of larger species of dragonfly can last as long as five to six months. There are a large number of species of dragonflies and damselfies in both the northern and southern hemispheres. They have long been associated with sinister overtones in Europe. Some English vernacular names such as “devils darning needle” and “ear cutter” link them with evil or injury. Swedish folklore holds that the devil uses dragonflies to weigh people’s souls. They are also often associated with snakes. The welsh name gwas-y-neidr means “adders servant” and in the southern United States the term “snake doctor” refers to a folk belief that dragonflies follow snakes around and stitch them back together if injured. 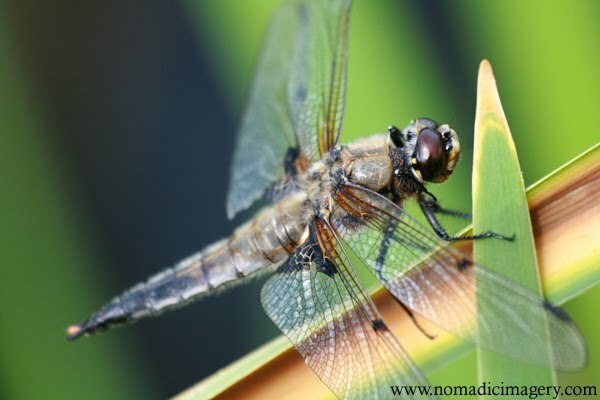 In China and Japan Dragonflies and Damselflies have uses in traditional medicines and in Indonesia they are eaten as a delicacy whether it be the nymph stage or adult. In the United States Dragonflies and Damselflies are sought out as a hobby similar to birding or butterflying, this is known as Oding a tag derived from Odonata which is the order of the insect in classification terms. In Texas there has been a grand total so far of 225 species observed. In Japan Dragonflies and Damselflies are of great symbolic value associated with late summer and early autumn. They are also symbols of courage, strength and happiness and often appear in art and literature especially in haiku. The love of dragonflies in Japan can be appreciated with the 200 odd species found in and around Japan having traditional names. In Japanese Tombo means dragonfly and boys are sometimes given the name due its symbolic meaning of courage and strength. There is world beyond our imagination. Thanks Senad, glad you like them and too true my friend, it's amazing what's out there if we open our eyes wide enough to gaze beyond the mundane. Well they're certainly great fun. Personally I got a set of Kenko Extension Tubes which turn ANY lens into a macro lens. (It does help to have a decent zoom lens though for dragonflies). They come in a set of three different sizes and are very cost effective plus they're nice and small to carry around. I'm just using the 12mm at the moment and it fits in the pocket when I'm not using it, have been using it for handheld shots, it works a treat if its bright enough outdoors. Well i guess ai have to try it, i might rent macro lens from rental place for one of my trips just to try it.